Our electric guitar packages come with all the basics you need to start playing. At Guitar.co.uk we check and set up every guitar in our Glasgow Shop. We check the string height action, intonation and give it a full inspection. We have been serving Scotland, UK and beyond for over twenty years now. If you need any expert advice on buying one of our electric guitar and amp packages then please don't hesitate to contact us. 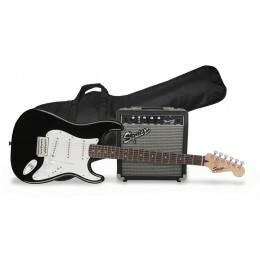 At Guitar.co.uk you will be able to find an electric guitar package to suit your budget. Every package includes an excellent beginners electric guitar. It is extremely important when buying your first guitar that it is properly set up. This is something we do at Guitar.co.uk as standard. There is nothing more off putting than trying to play a badly set up guitar. It can be a real struggle. As well as selling manufacturer's own packs we also tailor make our own. We have selected a range of products that are extremely handy when buying a beginners guitar. With an electric guitar you need an amplifier to get it to work properly. Our electric guitar kits pretty much always include an amplifier. You will also need a lead to plug it in. You may also want a guitar strap and some plectrums. All Electric guitar packages usually include those core ingredients. We are also happy to make you up custom electric guitar packages if there is a particular brand you have in mind. Please just let us know.